Air temperature and snow cover variability are sensitive indicators of climate change. This study was undertaken to forecast and quantify the potential streamflow response to climate change in the Jhelum River basin. 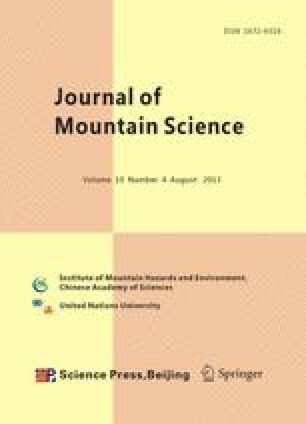 The implications of air temperature trends (+0.11°C/decade) reported for the entire north-west Himalaya for past century and the regional warming (+0.7°C/decade) trends of three observatories analyzed between last two decades were used for future projection of snow cover depletion and stream flow. The streamflow was simulated and validated for the year 2007–2008 using snowmelt runoff model (SRM) based on in-situ temperature and precipitation with remotely sensed snow cover area. The simulation was repeated using higher values of temperature and modified snow cover depletion curves according to the assumed future climate. Early snow cover depletion was observed in the basin in response to warmer climate. The results show that with the increase in air temperature, streamflow pattern of Jhelum will be severely affected. Significant redistribution of streamflow was observed in both the scenarios. Higher discharge was observed during spring-summer months due to early snowmelt contribution with water deficit during monsoon months. Discharge increased by 5%–40% during the months of March to May in 2030 and 2050. The magnitude of impact of air temperature is higher in the scenario-2 based on regional warming. The inferences pertaining to change in future streamflow pattern can facilitate long term decisions and planning concerning hydro-power potential, water resource management and flood hazard mapping in the region.